"The kinds of tools and applications that enabled social networking sites to change how people use the web are now available for groups that want to build communities based on a single, common topic, and now we are seeing the creation of these kinds of communities; which brings us to our website of the month. 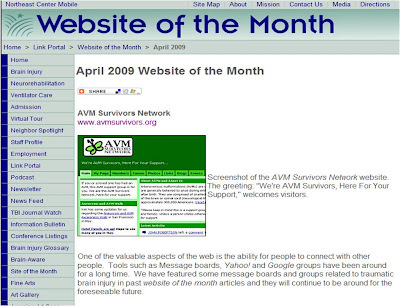 AVM Survivors Network is a social networking site dedicated to individuals who have Arteriovenous Malformation (AVM) and utilizes the social networking concept to provide support and resources for a community of AVM survivors on the web. It utilizes many of the same tools and features that you'll find on MySpace or Facebook. The site was started by Ben Munoz, an AVM survivor who recognized a need for other survivors to be able to support one another."